Investing in precision workholding equipment and high performance tooling enables first-pass machining and finishing in a single setup. 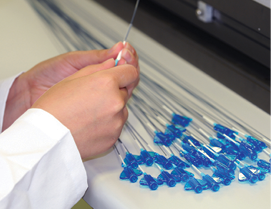 Highly specialized medical applications have redefined accuracy and precision. In conventional machining, these have traditionally referred to the ability to hold tight tolerances. Modern requirements are often involved with other factors as well. Components demanding a high finish are typically moved from turning or machining centers to specialized grinding or polishing machines. Today, this is less than practical for many reasons, including the fact that moving workpieces between machines risks inaccurate positioning. Multiple machine operations are also more expensive because of equipment costs, tooling, and the time involved in making the transfers. With precision workholding equipment and high-performance tooling, it is possible to complete first-pass machining and finishing operations in the same setup – an increasingly important flexible workholding consideration, especially for orthopedic devices. Manufacturers have to be prepared to produce up to 14 specialized products in small-to-medium batches while maintaining quality. Multiple processes performed include milling, drilling, and turning both inside diameter (ID) and outside diameter (OD). Changeover time is a major consideration in meeting customer needs and in keeping shops competitive. The highly competitive nature of medical manufacturing also has redefined the concepts of economics and competitive advantage. This has created a management model that places as great a value on preparedness as it does on meeting present-day challenges, making the flexibility of their workholding system paramount. For many medical device manufacturers, proprietary coatings and surface treatments can play a significant role in product development. Silicon dioxide, or silica, is one of the most fundamental elements on earth. Most commonly found in nature as quartz, it is the major constituent of sand and a primary component in silicone and glass. Now, this basic chemical compound is being applied using plasma-enhanced chemical vapor deposition (PECVD) techniques as an anti-microbial barrier, a primer to promote adhesion between stainless steel and proprietary coatings, or to create hydrophobic or hydrophilic surfaces. For many medical device manufacturers, proprietary coatings and surface treatments can play a significant role in product development and upgrading legacy medical devices under 510(k) guidelines. As a result, the medical device industry is aggressively investigating and applying plasma-applied coatings to products such as stainless steel guide wires, catheters, stents, and vascular surgical tools. “We are always looking for unique and novel ways to make our products more robust and become the market leader, but to do that we need to bring more technology to our devices. Often, that is going to involve some form of coating to functionalize the surface,” explains Aaron Baldwin R&D project group leaders at MicroVention, a company that offers neuro-interventional products including access products, intraluminal stents, occlusion balloons, and polymer coils. The PECVD process deposits thin films from a gas state (vapor) to a solid state on a substrate. PECVD deposition of silicon dioxide often requires organic silicons are as the feedstock. Within this family, the best known are hexamethyldisiloxane (HMDSO) and tetramethyldisiloxane (TMDSO). HMDSO is an affordable, flexible reagent that is commercially available in a high purity, liquid form. The volatile, colorless liquid can be plasma-polymerized to create a variety of surface coatings that are safe for medical use. Depending on the composition of oxygen to HMDSO, the property of the surface can be hydrophobic or hydrophilic. This flexibility makes HMDSO and other siloxanes the ideal choice for PECVD. By adjusting the parameters and other gasses added, chemists can tightly control the material to address a wide range of applications. For the medical device industry, organic silicon use falls into the primary categories of protective barriers (antimicrobial, antifungal, anti-corrosion), as a primer between stainless steel and exotic metals and proprietary surface coatings, or to modify the surface to become hydrophobic or hydrophilic. Adhering coatings to surfaces can be difficult with metallic substrates such as stainless steel or exotic alloys. Hexamethyldisiloxane (HMDSO) can be used as an intermediate layer to improve the adhesion between a coating and substrate. For example, stainless steel guide wires are often coated to make them more lubricious to ease insertion. By applying a thin layer of silicon dioxide, the lubricious coating grafts nicely to a stainless surface. Organic silicons also can be applied as a linking chemistry between other difficult-to-adhere-to surfaces such as ceramics and Polytetrafluoroethylene (PTFE Teflon). Drug delivery devices that use ceramic nozzles with micron-sized openings are coated with PTFE to prevent clogging. Depositing a 100nm to 150nm layer of HMDSO promotes the bond between the two substances. Anticorrosion is becoming increasingly important in medical devices, particularly to protect small microelectronic circuit boards in hearing aids, intraocular devices, implantable sensors, and pacemakers. To protect electronics, HMDSO coatings are applied in a relatively thick coating of a micron or more. HDMSO is water and gas repellent – properties required to prevent corrosion. A thin layer (~100nm) of PTFE can also be applied if the HMDSO will be exposed to harsh chemical acids or bases. For vascular surgical tools and instruments that become fouled with tissue debris or blood, coatings can keep a surgeon’s tool cleaner, longer. Applying a hydrophobic (water-repellent) coating on surgical devices creates a surface that blood and tissue sheets off easily, giving the surgeon better visibility. At the other end of the spectrum are hydrophilic (affinity to water) devices. Depending on what is required, organic silicons can be used to create such surfaces with either polar or dispersive surface energy. There are many strategies to achieve an anti- microbial surface including cell harpoons, amphipathic surfaces, antiseptics bound to the surface, and non-stick coatings. In a unique application, chemical vapor deposition is being used to embed nanosilver particles in a thin layer of organic silicon to prevent microbial adhesion and protect against corrosion. Silver ions can be embedded in a thin layer of silicon dioxide to kill any bacteria present. Despite the flexibility of PECVD- applied organic silicons, developing the precise chemistries, added gases, and plasma equipment design requires a close, collaborative relationship between medical device designers and equipment manufacturers. Because MicroVention already had an established relationship with PVA TePla – several of its plasma chambers were already being used to aide in coating adhesion – Baldwin began consulting with them on a project to determine the benefits of coatings for stents. Plasma equipment manufacturers fall into two categories, Baldwin says, those that produce commodity, off-the-shelf products and those that design and engineer systems to fit the needs of a specific application and/or to resolve unique surface energy challenges. So, when companies present PVA TePla with a challenging surface chemistry problem they are encouraged to visit the lab in Corona, California, giving them an opportunity to brainstorm with their technical team and run experiments together. Many of the best experimental matrices and ideas are produced during these technical customer/supplier meetings. In addition to designing and manufacturing plasma systems, the company also serves as a contract manufacturer and has in-house equipment needed to run parts and conduct experiments with full customer involvement. Every PVA TePla system is designed to meet the application requirements, which can include unique fixtures, unique electrodes, and chamber modification to accommodate throughput and coating uniformity. The ability to thoroughly clean the chamber after each application of organic silicons is a major consideration as it coats the entire interior of the chamber (including the electrodes) in addition to the products receiving the coating. As a result, PVA TePla modifies the chamber to make it easier for the user to clean it after every coating application. MachineMetrics monitoring software connects to machines and delivers data to the shop floor, saving money, improving morale, and increasing competitiveness. Connecting machinery to computer and communications can boost productivity by offering insights into operations. Eric Fogg, co-founder and COO at software provider MachineMetrics identified these critical benefits in an interview with Today’s Medical Developments. 1. What are the risks when a company connects machine tools for monitoring? Fogg: Connecting equipment for monitoring can present a security risk when not done correctly, however doing so securely does not have to be expensive. MachineMetrics has worked and consulted with information technology (IT) security experts to make sure our system is safe. 2. What are the benefits when connecting machine tools for monitoring; how does that outweigh the risks? 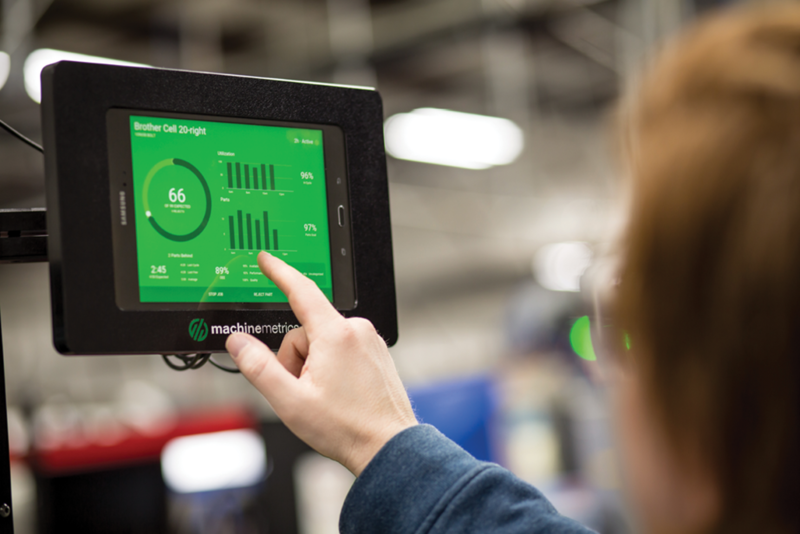 Fogg: Those that connect to machine monitoring are increasing production by making better decisions driven by data, enabling better, real-time communication between management and the shop floor. 3. What are some hesitations heard when considering implementation of a machine monitoring system? Fogg: Security is usually the top concern. After that, customers worry if they are ready to handle all the data and if they have the time and staff to act on it. 4. What steps should a machine shop take in order to protect equipment it plans to monitor? Fogg: Since we pull data directly from machine controls, and our system is cloud based, all computers in the plant are separate from the monitoring system. Though it’s good practice to keep up with updates, password protection, etc., it has no impact on the security of MachineMetrics. All a shop has to do is run network cables to each machine (wireless is available as well) and MachineMetrics takes it from there. 5. How do machine monitoring, dashboards and data transparency save money, increase competitiveness, and improve employee morale? Fogg: The transparency of the system allows companies to acutely understand problems, bringing problems to the surface much quicker than before. By partnering with machine tool resellers, tooling companies, integrators, and machine builders that resell MachineMetrics to customers, companies can have access to their customer’s data (if the customer agrees), helping monitor the health of a machine, tool, or implementation. MachineMetrics increases machine utilization by 15% to 25% in most shops by allowing customers to understand how well their investments are working for them and where they should be investing further. Employees can be approached about problems within minutes or hours of an event, not the end of the day or week when the problem is inflated. This turns the conversation between management and employees from frustrated or angry when a job is late to more helpful when the problem has just occurred and can be worked through for improvements. With setup times varying by operator and shift, job changeovers are the biggest source of lost production time for a business. Using monitoring systems enables a business to track setup time by incorporating it into the workflow when dispatching jobs. The software’s Operator View allows operators to start and stop jobs, categorize downtime, and reject parts for quality assurance. Operators also gain confidence that supervisors are going to address problems proactively and involve them in the process, and supervisors gain confidence that their employees are engaged. MachineMetrics help manufacturers make faster, more informed decisions from real-time machine data made intelligent with context from operators. 6. What have machine tool companies responses been when job shop owners realize they don’t need to invest in more equipment once they have data and have learned how to improve production with current machines? Fogg: Machine tool companies like machine monitoring software because they know that their customers’ success and profit is good for them in the long haul when equipment performs up to stated specifications or better. 7. What is the minimum improvement a shop can expect to see once implemented? Fogg: We usually see a minimum of 10% increase in productivity as well as more confidence in quoting and capital expenditure decisions. Information such as cycle times, performance, number of parts produced, rejects, downtime reasons, and reject reasons can be collected for each part operation. This information allows managers to quickly identify issues related to specific operations and measure the effectiveness of process improvements. Instant notifications, real-time dashboards, and detailed analytics drive manufacturing efficiency. 8. How is MachineMetrics set apart from market competitors? Fogg: We are focused on building simple software that focuses on providing a human context to data, something no one else is currently doing. In addition, by being cloud based, our software is dynamic with new features and updates weekly. About the author: Elizabeth Engler Modic is editor of Today’s Medical Developments and can be reached at emodic@gie.net. Contract manufacturers, job shops, and original equipment manufacturers (OEMs) in the medical device industry require improvements to productivity processes to stay competitive. Contract manufacturers, job shops, and original equipment manufacturers (OEMs) in the medical device industry require improvements to productivity processes to stay competitive. And, medical part manufacturing poses a variety of challenges, as high-precision parts incorporate a range of full 5-axis moves. For example, highly precise complex parts used to fix bones are rarely composed of straight or square shapes, instead involving contours for functionality and aesthetics. Implants benefiting from advanced machine technology include bone plates and screws, femoral heads and acetabular cups for hip replacements, and parts for knee and spine implants. Components can range from just less than 1" to more than 10" long and are typically machined from high-performance titanium and stainless steels alloys, as well as medical plastics such as PEEK. Growth from a surge in customers, along with a more diversified customer base, increases the pressure to raise output while controlling manufacturing costs. More often than not, the answer comes from advanced, all-in-one, productivity-enhancing machining systems that provide integrated productivity-boosting packages with high-speed spindles, multiple-pallet automation, full 5-axis positioning, and user-friendly controls. For one medical shop, advanced machining systems were critical to increasing productivity. The shop machined implants with 5-axis machining centers with 15,000rpm to 20,000rpm spindles, trunnion table 5-axis capability, and two-pallet automation. However, a surge of incoming work and a desire to optimize existing jobs forced the shop to consider machining platforms with higher rpm spindles, smaller footprints, and more pallets. 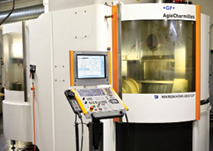 Mikron HSM 400U LP machining centers from Lincolnshire, Illinois-based GF Machining Solutions provided solutions. The shop now has three Mikron HSM 400U LP machines with 42,000rpm HSK-E40 spindles, tilt-table trunnion 5-axis capabilities, 220° of B-axis rotation, Heidenhain iTNC 530 controllers, and rotary automation systems with 18 workholding pallets. The machines occupy two-thirds of the floor space, weigh less, and have larger work envelopes than the previous machines. Vector spindles on the machines deliver consistent surface finishes and part details, while reducing machining time for semi-finishing and finishing. With high dynamics and 1.7g acceleration, the machines reduce non-cut time and maximize spindle utilization. Liquid-cooled, linear direct-drive motor technology allows short setting times and high dynamic rigidity of the attitude control. The linear direct drive with central oil lubrication reduces friction-induced wear and ensures long-term precision. To orient complex, contoured parts such as bone plates for drilling, threading, and surfacing, medical shops often use 3+2, 5-axis positioning techniques. The Mikron axes rotate up to 200rpm, reducing positioning time when compared with trunnion-table 5-axis machines. The Mikron HSM 400U LP delivers process stability for 5-axis simultaneous machining. Fast workpiece positioning is critical for medical parts that have 20 to 30 threaded holes. When each hole requires machining a flat, a counterbore, a through-hole, and a thread, small amounts of extra speed in B-axis rotation results in long-term cycle time reductions. With higher spindle speeds and faster 5-axis part positioning, the Mikron mills reduce cycle times 20% to 30%. To optimize application of the Mikron machines’ pallet systems, some medical shops fit pallets with a tombstone that can hold multiple similar parts, enabling consistent tool packages and eliminating the need to change fixtures. This approach ensures lights-out operation between shifts without loading, unloading, or removing fixtures. With the machines’ Heidenhain controls, operators can perform edits at the machine in the conversational mode saving programming time and minimizing delays. Cost savings through automation are also changing the way medical contract manufacturers look at machine tool purchases. Machine tools with pallet changing or bar feeding capability can provide maximum versatility and productivity. Such integrated automation allows manufacturers to be competitive and get the most out of their equipment and skilled workforce. A concurrent benefit is flexibility. For the medical shop with the Mikron HSM 400U LPs, typical job lot sizes range from 10-to-300 pieces, yet it often receives five-piece orders as well. The machines make setups for these jobs fast and accurate, while their pallet changers boost efficiency for the shop’s legacy products. The shop proves out and validates small batches of prototype parts, then when repeat orders come in, program and fixturing are ready to begin production. With tolerances around 0.0005" and surface finishes such that post-machining, finishing operations on medical parts must be limited to only deburring of complicated double- or triple-lead threads. 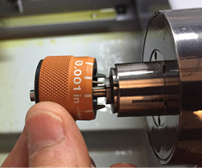 Part precision and quality are crucial in machining processes. In addition, this minimizes the need for hand finishing, significantly reducing the possibility that a part will be scrapped due to inconsistent manual processing. 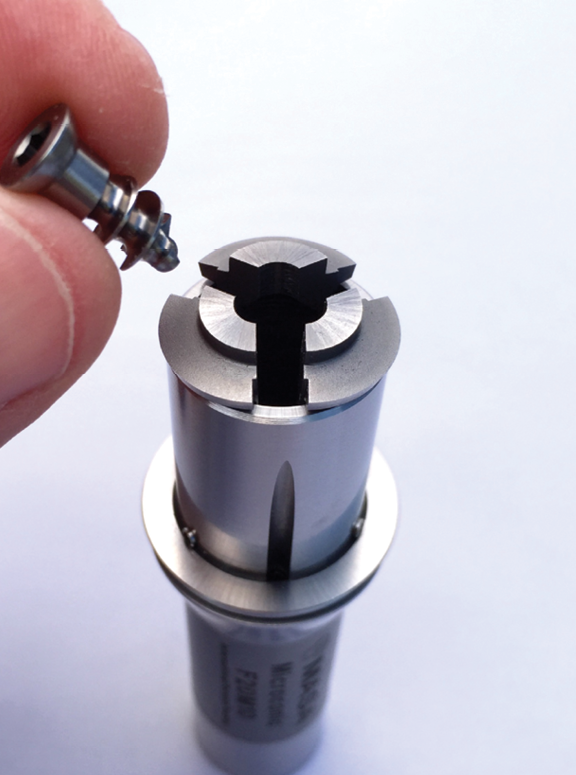 High-speed machining techniques contribute to manufacturing quality, efficiency, and cost control, allowing medical contract manufacturers, such as the one using the Mikron HSM 400U LPs, to replace custom tools with lower-cost, off-the-shelf tools. Rather than roughing a part, creating a contour with a form tool, and then finishing with other tools, the shop applies one roughing tool and one finishing tool to complete a part. Medical parts contract manufacturing demands a level of responsibility beyond that of general machining. Start-to-finish control is crucial because medical parts must be perfect. Medical contract manufacturers purchase certified raw material and bring the parts to their final dimensions, completing first piece, in-process, and final inspections, certifying that a part is ready for human use. Customers rely on the manufacturers’ process control and team to provide consistent products. Investment in the right machining technology helps medical contract manufacturers deliver quality products on time.